← How About Some Stock Cars for Your Livestock? 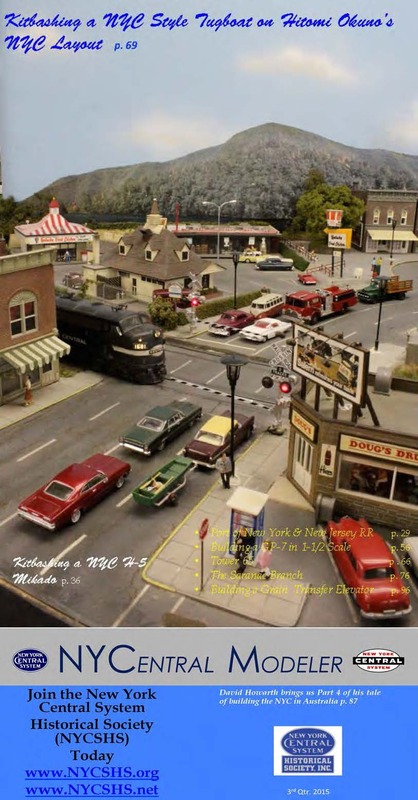 Don’t miss “Kitbashing a NYC H-5 in HO-Scale” by Tom Bailey, Gordon Peterson’s “Port of NY & NJ Railroad”, with some fantastic O-scale modeling, “Fond Memories & My Favorite Diesel” by Dave Wheeler, “Drawing of Tower” by Dan Seligmann and “Saranac Branch of the NYC” by Dave Gallaway. From Japan, a wonderful article about “Kitbashing a NYC Style Tugboat” by Hitomi Okuno, and Seth Lakin tells us how to kitbash a “Grain Transfer Elevator and Truck”. Don’t miss another chapter in the forth article by Australian, David Howard, “NYC West Shore Part 4”. Manuel Duran-Duran and Larry Faulkner show us how they designed and built some of the TrainMaster, LLC. NYC Section Houses in HO-scale in their regular features, “The NYC Engineering Department” and “Harmon Files”. And all of the regular features are there again for you to enjoy. Be sure to tell all of our model railroading friends to join you in downloading the NYCentral Modeler or just enjoy reading it on your screen. Click Here to Begin Reading!! !